Description: N.K. Brown Medicine Co. was located at 115 ST Paul Street Burlington, Vermont. N.K. 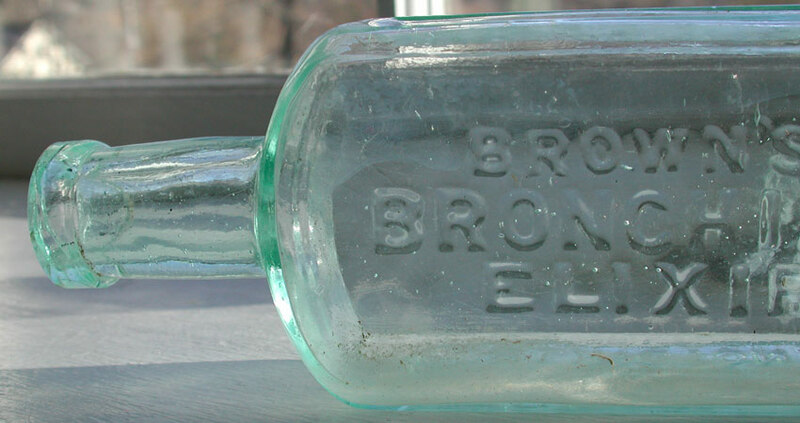 Brown prepared many patent medicines including Brown’s Teething Cordial, Star Broches, Bronchial Elixir, Fluid Extract Buchu and this Bronchial Elixir. Nathaniel K. Brown was the successor to Fred Smith of Montpelier, Vermont. They produced Smith’s Anodyne Cough Drops with great success. Labeled example (see photo) states, “For the Cure of Coughs, Colds, Hoarseness, Bronchitis, Sore Throat, Whooping Cough and All Diseases of the Lungs. Condition: Very good, some light spotty haze. No chips or cracks.